Dr. Sacks has greatly enjoyed reading your letters, emails, and guestbook comments. Your stories, appreciations, memories (to say nothing of afghans, salmon, gefilte fish, artworks, photographs, and music) are what keep us all uplifted in the midst of his battle with cancer. We cannot thank you enough for this outpouring of support and affection. It is a daily reminder to the good doctor of his long, adventurous life, the high points of which have always been his communion and conversation with his readers and the privilege of seeing and helping his patients. As he described in his recent New York Times piece, “My Periodic Table,” he recently visited some lemur friends in North Carolina, thanks to the extraordinary Duke University Lemur Center and its director, Anne Yoder. 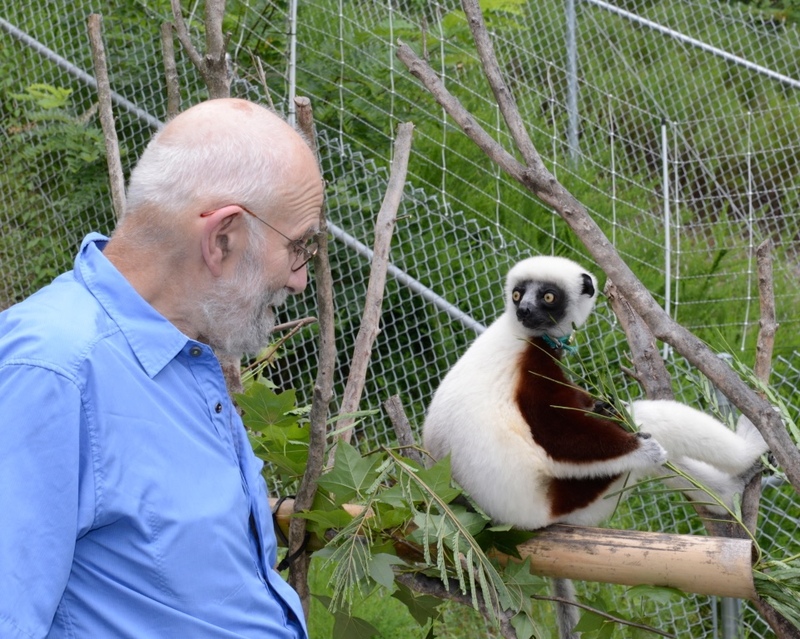 Below is a photo of Dr. Sacks with his new friend, Pia, a Coquerel’s sifaka. We are proud to announce the establishment of the Oliver Sacks Foundation, a nonprofit organization devoted to increasing the public understanding of the human brain and mind through the power of narrative nonfiction and case histories, and to making the world a better place for those with neurological or psychiatric challenges. More info coming soon! Finally, keep an eye out for Dr. Sacks’s newest article, “Sabbath,” now online at the New York Times and in the upcoming Sunday Times print edition. A new Oliver Sacks book is on the way!